Yesterday at church a little girl impressed me with her giving spirit. Our church is a little different. We don’t sit in rows but at tables. 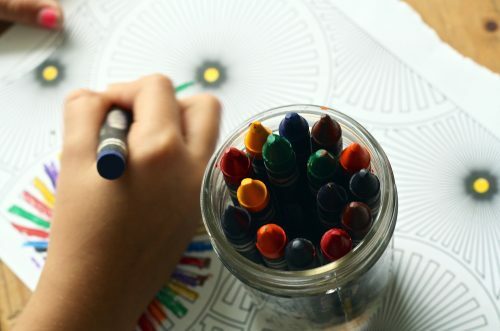 We have a singing worship service in which the children stay and can color and listen quietly. One child found some small paper plates and began making figures on them. As we sung, she went around the room giving each of us a special paper plate, smiling at us. She loved the act of giving her creations to others. I felt blessed by her giving spirit just as feel blessed by the giving spirit of our #LMMLinkup community. This is not a pat post, but one that examines the real issues behind the verse: Romans 8:28. It is a deep, provocative look this popular verse. I would not miss this very poignant post! Rachel takes a trip to a local pool with her children and turns it into a wonderful spiritual lesson. Be sure not to miss this post. What a sweet little girl. Thank you for sharing. You bless me! Blessings to you too, Jennifer. Thanks for stopping by. I would love to hear more about your church! My husband is always saying how much he hates pews and wants people to interact more. We also love keeping children in the service, at a minimum for the singing and communion. Do you not have a sermon? Yours sounds wonderful! I have always loved going to “5th Sunday Sings” when it is all a capella. Our church has speakers and not necessarily one preacher. It is very nice. We all discuss issues together too. I look forward to reading Laurie’s post. Thanks for hosting! What a sweet gift and example! Such a sweet story. And thank you for hosting! What a precious story! Those childlike hearts are such a blessing, aren’t they? I love the way that your church includes the little ones. My heart is so stirred by the precious joining with God’s heart when we all are connected in Him. Blessings to you! What a sweet little girl! I hope she always maintains that giving spirit and doesn’t question the gifts themselves. That’s a beautiful story about the little girl! It’s true there is joy in giving! Sounds like an interesting way to worship, Mary. I’ve been in services where the children were allowed to come in toward the end to worship and mill about freely, but never the entire service. I think that’s wonderful how that little girl set out to bless those around her. And I’m also grateful that you noticed it and shared about her kind act here. It truly is the little things that matter the most sometimes. Thanks for hosting, my friend! Pinned! What a beautiful story (and what a cool way to do church!). I hope that I can make a habit of giving more than receiving :). Congratulations to Laurie and Rachel for being featured! And to that little girl with the giving heart! Thanks for sharing her with us! Thank you so much for featuring my post, Mary! I love reading the bloggers who link up here. I feel like I have found my tribe! 🙂 Thank you so much for your very kind words.